The dinosaur skeleton will be put on display in Glasgow's Kelvin Hall as part of a European tour. Roaring success: Trix the T-rex has embarked on a European tour. 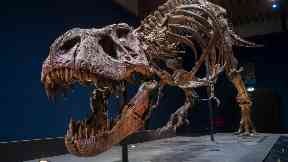 A 39ft-long Tyrannosaurus rex skeleton has arrived in Glasgow on the latest stop of its European tour. Trix the T-rex - which weighs the same as four Mini Cooper cars - will be housed in a bespoke, climate-controlled 600 square metre pavilion at the city's Kelvin Hall. It takes three days to construct and will go on display to the public from April 18 until July 31 in an interactive exhibition which also includes a painted reconstruction of the 5000kg dinosaur. Awesome: Trix the T-rex will be on display in Glasgow's Kelvin Hall. Steph Scholten, director of The Hunterian which organised the exhibition, said he is delighted to welcome the fossil to Scotland. He said: "Bringing this major touring exhibition to the city will allow thousands of Scots, and visitors to Scotland, to see one of the world's most iconic dinosaur species. 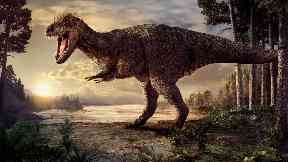 Amazing: An artist's impression of a Tyrannosaurus rex. "Tyrannosaurus rex skeletons are very rare finds and Trix is the only real touring T-rex fossil in the world. This is a major coup for Glasgow, which is the only UK stop on her European tour. 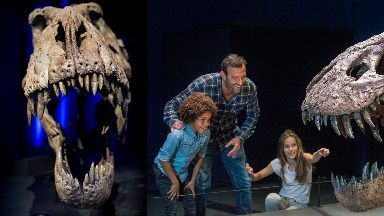 "T.rex in Town offers a once in a lifetime experience for visitors to come face to face with a real T-rex and learn about her life through this superb interactive exhibition. "We hope everyone who comes to see this incredible dinosaur specimen will be as excited to see her as we are." 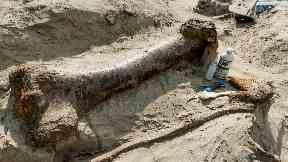 Discovery: Trix the T-rex was unearthed in Montana. Dinosaur fans have also delighted in having the famous Diplodocus sculpture Dippy at Glasgow's Kelvingrove Art Gallery and Museum - across the road from Kelvin Hall where Trix is being exhibited. Glasgow councillor David McDonald said: "Like thousands of other visitors, I am really excited to see this impressive, if slightly scary, creature take shape before my eyes. "It's incredible to watch the skilled team from Naturalis in the Netherlands bring this extremely rare real dinosaur skeleton to life in Glasgow. "We look forward to welcoming many dinosaur fans to Kelvin Hall over the coming months, where Glaswegians and visitors to the city can enjoy this unique opportunity to stare into the eyes of one of the most terrifying predators ever to have stalked the earth. "Until May 6 visitors can also marvel at Dippy, the Natural History Museum's famous Diplodocus, at Kelvingrove Art Gallery and Museum. "We trust these spectacular exhibitions will inspire curiosity about the natural world around us."